According to results obtained by the spaceborne UVolution experiment supported by CNES, carbonates would appear to withstand solar UV radiation. 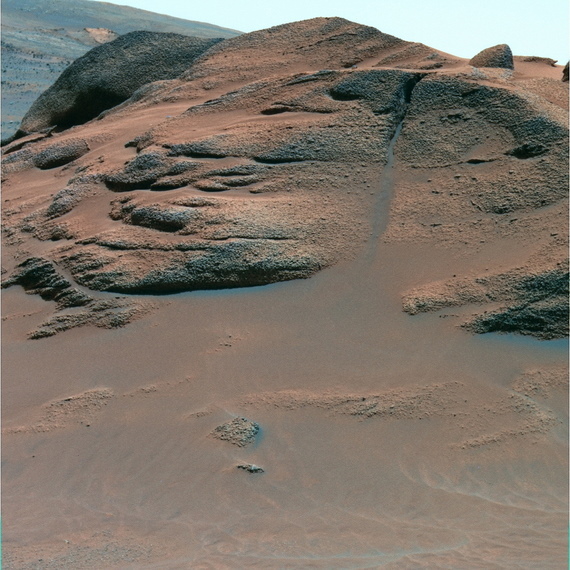 This is a significant discovery for Mars, since these minerals only form when water and certain bacteria are present. Comanche rock outcrop where the U.S. Spirit rover found carbonates in 2005 on Mars. Credits: NASA/JPL/Cornell University. Some scientists believed that no or few carbonates have been found on the surface of Mars because they had been broken down by UV radiation. The experiment we ran for the first time in space disproves that theory,” affirms Hervé Cottin, as astrochemist at the LISA1 inter-university laboratory for the study of atmospheric systems. Carbonates are calcareous minerals that only form where liquid water is present. Some of these minerals are also produced by primitive living organisms like bacteria. So finding carbonates on the surface of Mars would confirm the presence of liquid water and possibly ancient lifeforms. 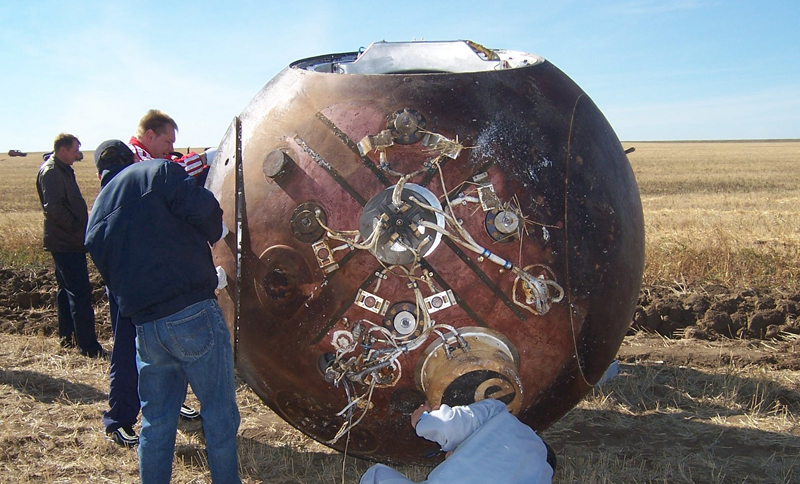 The FOTON capsule was retrieved in 2007 after being exposed to UV radiation in space for 12 days; the BIOPAN module is in the hands of the technician in the light blue shirt. Credits: LISA. Carbonates have been exposed to UV radiation before in the lab but never in real-life conditions. 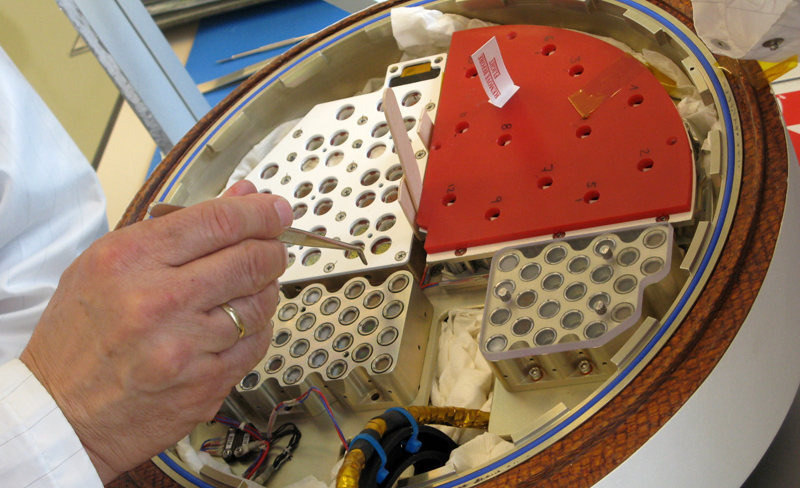 So we placed a few samples of abiotic2 and biotic carbonates inside the BIOPAN module on the Russian FOTON capsule orbiting at an altitude of 300 km,” explains Hervé Cottin. “After being exposed to solar UV radiation for 12 days, the UVolution experiment was returned to Earth. Analysis of the samples combined with laboratory experiments showed that the carbonates had remained stable,” says Cottin. So there’s no reason why we shouldn’t find carbonates on Mars. ESA’s BIOPAN module, where the UVolution experiment was housed. Credits: LISA. Another question intriguing researchers is this: if we do find carbonates on the surface of Mars, could we tell where they came from? In other words, could we find out if they had been produced by bacteria billions of years ago? “We know that biotic carbonates break down, under certain conditions, at temperatures of around 850°C, whereas abiotic carbonates only break down at 900°C in pyrolysis experiments,” says Fabien Stalport, an astrobiologist at LISA. “And during the UVolution experiment, we showed that carbonates exposed to UV radiation could retain this biological signature." Terrestrial carbonates are retrieved from the BIOPAN module after exposure for 12 days to UV radiation in space. Credits: LISA. Until the day Mars rovers are able to scoop up samples of the precious minerals, a new experiment called PSS3 is set to be performed on the International Space Station in 2012. And this time, carbonates will be exposed to UV solar radiation for 18 months. 1 Laboratoire Interuniversitaire des Systèmes Atmosphériques (Paris-Est Créteil and Paris Diderot universities, UMR 7583 CNRS, IPSL). 2 Produced by physical-chemical processes rather than biological processes. 3 Photochemistry on the Space Station.